Guru Gobind Singh’s birthday (Guru Gobind Singh Jayanti) is a Sikh holiday celebrated on January 5. It is dedicated to the tenth and last Sikh Guru. The holiday has an official status in some Indian states. Sikhism is a religion that originated in the Punjab region of the Indian subcontinent. Despite being one of the youngest religions, it is the ninth-largest among the major world religions. Sikhism is based on the spiritual teachings of the ten Sikh Gurus, starting with Guru Nanak and ending with Guru Gobind Singh. Gobind Singh was born in 1666 and was formally installed at the leader of the Sikhs at the age of nine, following the death of his father, the ninth Sikh Guru Tengh Bahadur. Guru Tegh Bahadur was executed under the orders of the Mughal Emperor for refusing to convert to Islam. 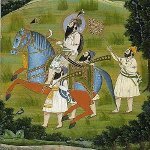 Guru Gobind Singh was renowned as a great warrior, spiritual master, philosopher, poet and polyglot. He participated in more than a dozen significant battles against the Mughal army and won most of them. Gobind Singh had four sons from two wives, but he left no successor because the Guru’s four sons died during his lifetime in Mughal-Sikh Wars. Shortly before his death he announced that Guru Granth Sahib (the central religious scripture of Sikhism) would now be the eternal living Sikh Guru. Guru Gobind Singh was born on December 22, 1666 according to the Gregorian calendar, but in the tropical solar Nanakshahi calendar used to determine the dates for important Sikh events his birthday falls on 23 Poh (January 5).